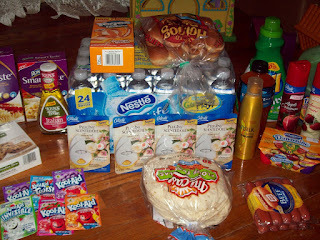 The grand total for all this was $57.27. I actually paid $24.29. Coupons are a beautiful thing! The Sunsilk Daring Volume variety of styling aids were all marked down to $1.50, so the $1.50 off coupon made them free. I like free! The All Small & Mighty was rolled back to $5, so it was only $4 after coupon. Not bad! Small bottles of Ken's Salad Dressing were $1.26, so .26 after coupon. It was a great trip! And the best part is that the cashier was very sweet about the coupons, she was just new and needed a lot of help with them. The folks behind me in line got kind of annoyed because of the wait, but they were all smiling after they saw how much I saved. If Walmart has left a sour taste in your mouth, you might give them another shot. Mine had improved dramatically. 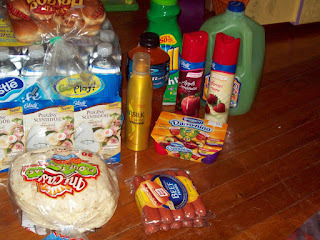 We hit up Kroger and CVS as well. I did okay at Kroger. CVS was great! I got one Right Guard deodorant, a reusable CVS shopping bag, a Contour blood glucose monitor, a gallon of Gandy's milk, a package of Oreos, 2 pkg. Quattro razors, and a 20oz. Diet Pepsi for $4.38. I have really missed CVS! My local store thought I'd died or something because I haven't been there in months! It was great to see "my" cashiers and find some good deals as well. It was a fun day! Ashley and I had a great time together! She is quite the little couponer in training! I just know she'll want her own binder any day now. 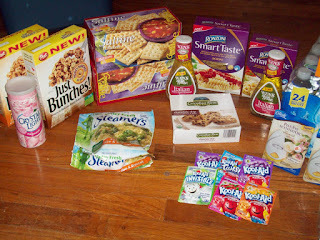 I know what you mean about couponing at WM!!! I don't know why they often make it so difficult but, I do think it depends a lot on the cashier! The last one I got was great, ran everything through, no problem. I had about $40 worth tha I used there. I'd given up on CVS some time back and haven't been in a long time! Waiting for some extra good deals to draw me back in. Our stores never have enough of the best deals stuff in stock tho! Glad you did so well!!! That gets you so pumped!!! Score!!!! I too am braving the coupons. We have double coupons here and normally there are lots of buy one get one free so I am doing good. I love your site, I grew up in Texas so it makes me feel a bit like home, I will certainly be back.